In this unusual dial, probably by Christoph Schissler, the outer side of the upper leaf is very finely engraved with strapwork and two coats-of-arms. The compass viewing hole is heart-shaped. In contrast, the rest of the dial is oddly simple and undecorated. 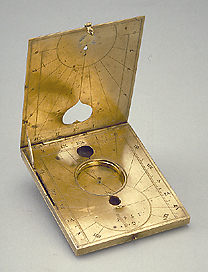 It has vertical and horizontal string gnomon dials for common hours. In the lower leaf is another heart-shaped hole, the use of which is not quite clear.